After twenty-four years of abundant growth, Blessed Junipero Serra Parish adds portable walls to their original parish hall. Additional classrooms has helped with their growing ministries. August 15, 2012 will mark the 25th Anniversary of the opening of The Blessed Junipero Serra Parish. 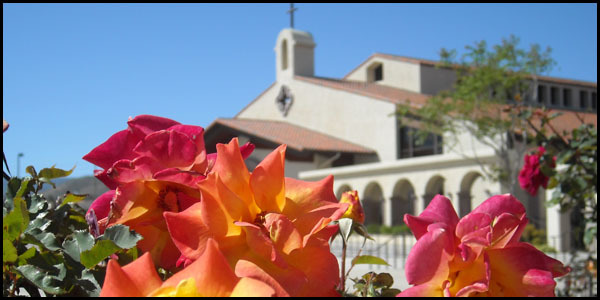 Founded in 1987, Blessed Junipero Serra located in Quartz Hill California, serves the Catholic Faith Community and offers many wonderful ministries to the Lancaster and surrounding areas. In 2002 a new sanctuary was built to accommodate abounding parishioners. In 2008 Father Leo was introduced to Blessed Junipero Serra and his fresh ideas have been vastly welcomed. The church continues to expand. Additional classrooms are needed for religious education, Sunday school classes and various meetings. Several companies were contacted to help with the modifications to the original parish. Screenflex was selected because of the ease of setting up and cleaning up. They were also pleased with the quality of the products. The ability to add posters and displays were also a benefit to the Screenflex dividers. Blessed Junipero Serra used our partition planning service to create the perfect size, height and width of the partitions. We offer a free planning service to any organization that needs help laying out their room. Blessed Junipero Serra uses their portable room dividers for many activities and meetings. Religious Education is offered in the fall and spring four days a week, the youth group ministry can break into private groups, wedding receptions have been held in the original parish hall using room dividers, prayer groups have more privacy with room dividers, the adult ministries use the partitions for various meetings, teachers and staff enjoy lunch in the room with the gorgeous floor to ceiling windows, nuns use the rooms for their private meetings and much more. Blessed Junipero Serra, we thank you for your business and hope you will have continued success. Enjoy your partitions.